In a spirit of celebration, the Christmas decorations have gone up around the office and the house, and I’m sat here wearing a silly Star Wars themed Christmas jumper. While we all celebrate at different times and for different reasons, I think we can all agree we’re all a little bit closer to When The Stars Are Right. With that in mind – Just Crunch Games offer up a special festive offer to Great Cthulhu and his followers. Buy all The Cthulhu Hack Books in print and get more than 10% off through the All Rolled Up web store. All in mono throughout on 80gsm off white bookwove with 250gsm matt laminated covers in full colour. 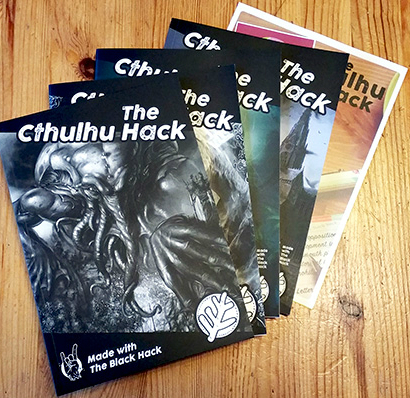 If you have picked up a copy of The Cthulhu Hack before you won’t have one of these – unless you already have a full set of books – as single copies are gloss laminated. The sale will run until Monday 12th December and only applies to The Cthulhu Hack (All) while stocks last! Gate into the All Rolled Up web store now!